Livable Hood River was instrumental in working with the Hood River City Council and Planning Commission to enact sensible regulations for short-term vacation rentals in our residential zones. These new regulations went into effect in October 2016. 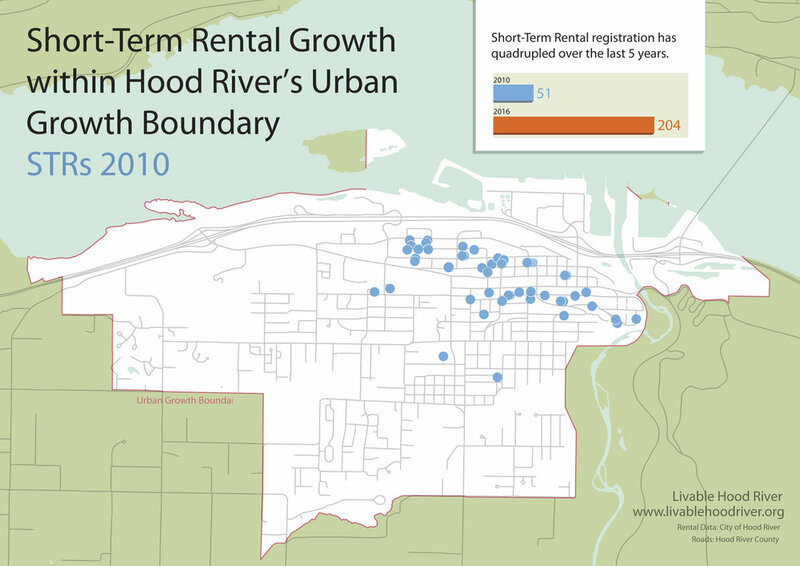 Regulating short-term rentals is an important step in addressing the availability of housing in Hood River. Since 2010, STRs in our city have grown at an astounding rate—quadrupling in just six years. More than two-thirds of these homes were purchased by out-of-town investors, who gobble up our limited housing supply and drive up housing prices. That hurts local residents, who can’t find a home to buy or rent. It hurts local businesses, who have trouble hiring workers if they can’t find housing. It hurts our schools, hospitals and other vital services that depend on a year-round population. Investors make the profit, but sadly, Hood River residents have been paying the price. Thankfully, we now have new common-sense regulations on the books. These rules will continue to allow some short-term by Hood River residents, but phase out other STRs that adversely affect our housing supply. The new regulations also help preserve the integrity, safety and quality of life of Hood River’s neighborhoods, by strengthening the permit process and addressing nuisance issues like noise and parking. What’s more, they help Hood River meet its housing obligations mandated by Oregon state law. Hood River’s residential zones are for residents, not commercial enterprises like vacation rentals. These new regulations will curb the detrimental growth of STRs, improve housing availability for residents, and keep Hood River a real community with a diverse economy. Livable Hood River is proud to have played a part in ensuring a healthy future for our neighbors and neighborhoods.